Verdant Dreams is back again! 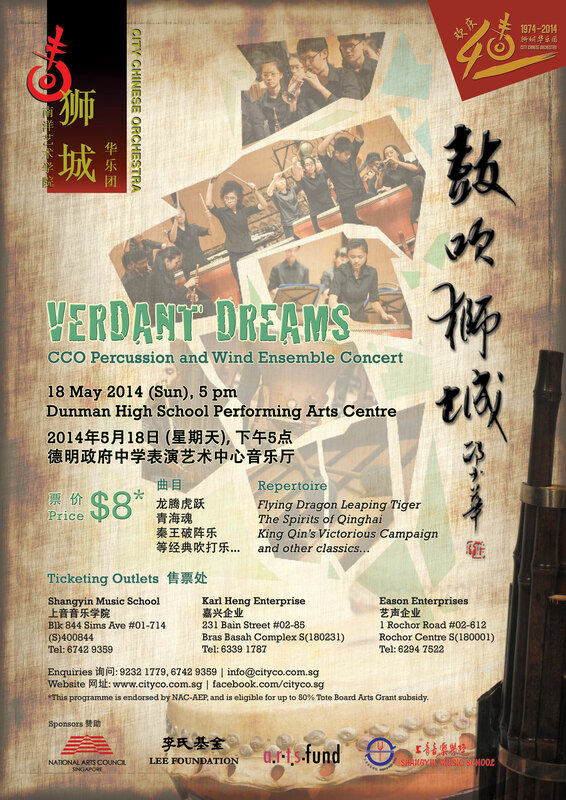 Come this May, lift your spirits with this vivacious performance by City Chinese Orchestra (CCO) Percussion and Wind Ensemble at the Dunman High School Performing Arts Centre (DHSPAC). Be enthralled with a spectacle of ensemble and solo pieces played on dizi, suona, sheng and percussion instruments! The 60-strong Percussion and Wind Ensemble is presently led by the orchestra’s artistic instructors Mr Ding Huai Cheng and Mr Tay Soon Dee, both distinguished performers in their field. Since its establishment the ensemble has been actively involved in the local Chinese music scene. Its demonstration of technical expertise and strong musical rapport in performances has been very well received by the audience. This concert is part of CCO’s 40th Anniversary Celebrations series. To find out how to get to Dunman High School Performing Arts Centre (DHSPAC), click here.